1st-3rd items: 3 piece silver tea set including small teapot, lidded sugar and small pitcher, all in classical design, marks on bases of three for 880 silver and sugar and teapot also with marks for Russian Second Kokoshnik Import mark. Teapot – 5″ H x 7″ W x 4 1/4″ D. 21.75 oz troy, 3 items. 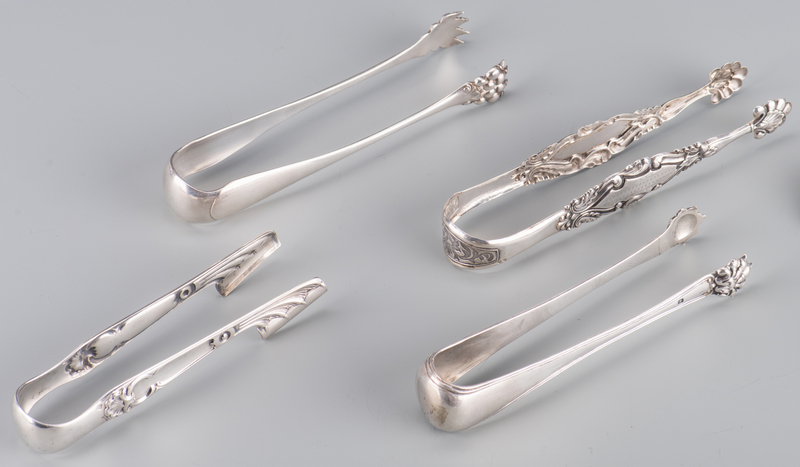 4th item: French 1st standard 950 silver sugar tongs, fiddle thread with animal paw tips, marks for Etienne Auguste Courtois, Paris, working 1834 – 1847, 6 1/8″ L, 1.885 oz troy. 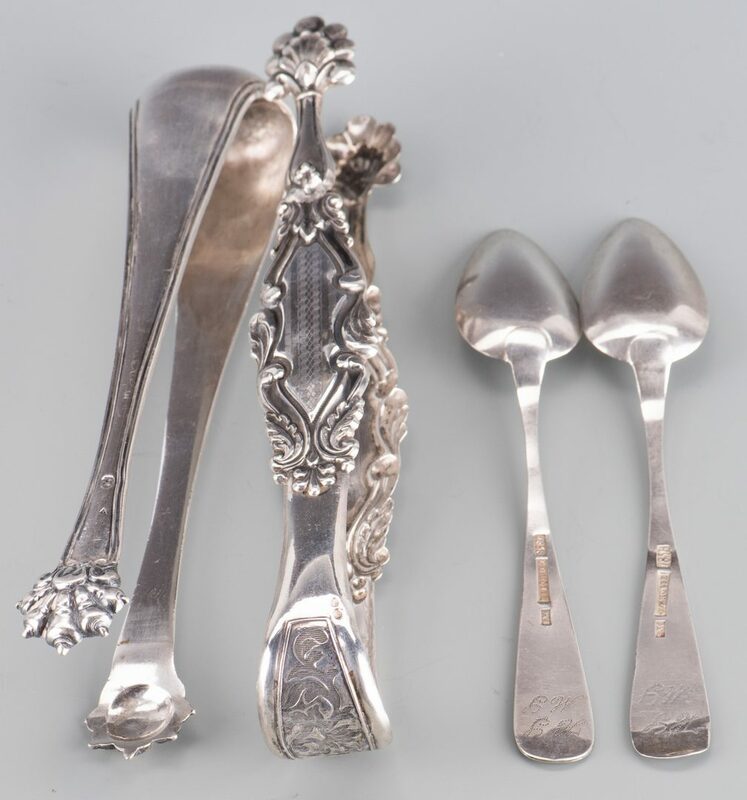 5th & 6th items: Two French Christofle likely silver plated sugar tongs, one with animal paw feet, 6″ L, other with serpent claw/tong feet, 5 1/2″ L, mid/late 19th century. 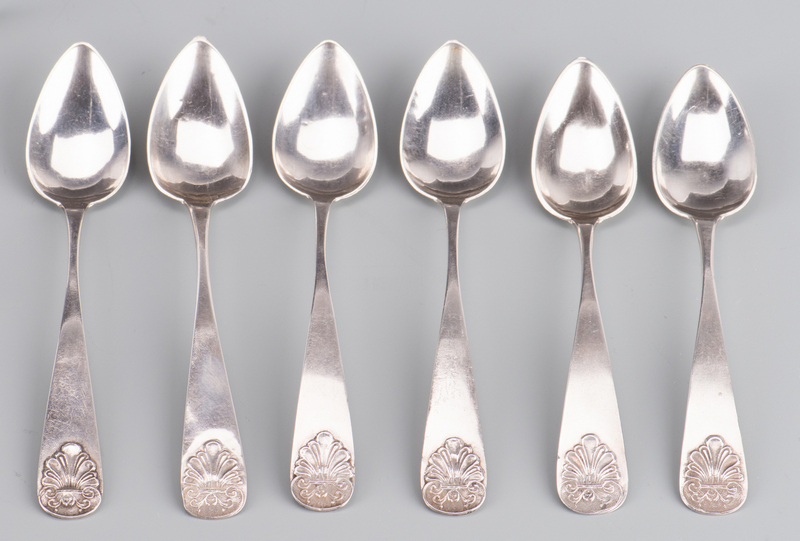 7th-12th items: Set of 6 Norwegian 830 silver shell tipt fruit spoons or five o’clock spoons, impressed marks for C. G. Hovie, 1858 and punched monogrameed en verso. 4 7/8″ L, late 19th/early 20th c., 1.85 oz troy. 13th item: Silver metal sugar tongs with shell tips, possibly German 812 silver, 6 1/4″ L. 0.785 oz troy. Provenance: Private Knoxville, TN collection. CONDITION: 1st-3rd items: 1/2″ L shallow dent on pitcher and minor surface scratches on each item. No monograms. 4th item: Two 1/8″ L hairline at bend. 5th & 6th items: Very good condition. 7th-12th items: Minor surface wear and monogrammed. 13th item: Repair to one arm.